History had shown for the Cup they wouldn’t play. A hushed silence fell for the South Africa game. We’d put up even money, now, with Unufe stepping out of his socks. South Africa scored twice, but the States had added a third. For the Sleeping Giant awoke and was battling for the Cup. There was pride in Bender’s bearing and a smile on Carlin’s face. With a score of 29 to 10, the Eagles were moving on. Defiance gleamed in Leuta’s eyes, a sneer curled Niua’s lip. And the English stood a-watching it in haughty grandeur there. “He moves too fast,” said England. “Try awarded,” the referee said. It seemed likely when Mitchell scored and the ref raised his hand. But one mournful look from England and the audience was awed. And they knew that they could not catch the mighty Eagles again. Who are these Finals upstarts? They should be in the Plate. The last defender is shattered by the force of Danny’s blow. It is all joy in America – the Mighty Yanks have won the Cup! EDITOR’S NOTE: When Pelicus Scriptoris demands the plume from one’s hand it is best just to smile, nod and try to learn. Those in the rugby world who do not know me as Scriptoris know me as Dr. Sevens. My first love had a more attractive younger sister: three years after I first had a crush on rugby I met my real love, Rugby Sevens. It was the Pleistocene Era of American rugby. Neither Rugby Magazine nor USA Rugby had yet been founded when I started playing; there were no rugby media whatsoever. You could go to a library and pull out weeks-old issues of the Sunday Times to see which international teams were any good if you were keen like me. Now you can watch many if not most games yourself. In particular, the Sevens World Series is not only web-casted to anyone with a phone, the games are archived for your pleasure. Well, it’s a pleasure if you are not yet ready to admit that it’s an addiction. What else has happened these forty years, since Rugby Magazine and USA Rugby were founded, and since the velocity of rugby information availability has continuously accelerated? Some of us have followed the (fifteens) Eagles from venue to venue, trailing along after the colors, the decades proving our dedication. Some of us have been privileged to have been involved with the games, especially when our boys used to play regularly in San Francisco at Boxer Stadium. Some of us have read about their wins and loses over the years, envying the generations of players coming and going, commenting on the coaching changes and always hopeful when a new direction was announced. Some of us have been optimistic when a few victories came together, but watched with the consternation that leads to resignation as the rest of the world ratcheted up their games after professionalism was admitted (to), and yet we continued to trail the field. And all of us have been reading about the sleeping giant of world rugby these forty years as well. It was probably the subject of the first editorial in Rugby Magazine. The metaphor might well have been our mascot. There he lay. There he snoozed. No offense is intended to all of those, many of whom read and write for this fine publication, who have striven mightily and given endlessly of themselves to stir this giant, but he’d been asleep at least twice as long as Rip Van Winkle. It proved very difficult indeed to arouse this fellow. It was announced in October of 2009 that rugby would be again contested by the family of nations at the Olympic Games in 2016. Americans might not know English prep-school sports played for fun and honor, but they know and can be persuaded to care about anything contested within the confines of those five interlocking rings. An increased focus on Sevens was the result, not the least by the players who think sure, it’d be great to represent the USA at a Test match somewhere, but it would be better to play on NBC TV in front of everyone you’ve ever known, some of whom didn’t think much of your rugby jones. Some of the seed of the sower falls on fertile ground. Sevens has proven to be that ground for USA Rugby. 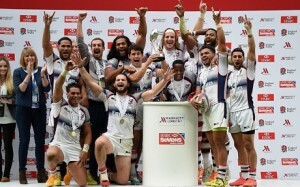 This past weekend your USA Eagles went undefeated in the London iteration of the Sevens World Series, winning their first-ever event and in the process beating two of the teams who have already qualified by merit for the 2016 Olympics. There were no fluke-victory, lucky-hop, or rub-o’-the-green wins among them. They kicked people’s asses and they got better as they went along. There is, of course, a Pelican angle on all that proves to be great in American rugby. You, dear reader, may well have refereed several of these immortal Eagles. Zack Test, the team’s best player over the past five years, did not play in this tournament due to injury, but he played his high school rugby on the peninsula and made an appearance at the Palo Alto Sevens three years ago. Danny Barrett, who made the all-tournament Dream Team, played for Cal and Golden Gate. Folau Niua played for East Palo Alto and Golden Gate. Thretton Palomo, brought in as an injury replacement for Test, played his high school rugby in Davis. His try in the final is not to be missed. Ask yourself: would you really like to try to tackle anything that weighs 275 pounds and can outrun you? Matai Leuta. This guy gets more than a thumbnail. If you have refereed Cal State – Monterey Bay in the last few years, or the Seahawks last summer in the NorCal Sevens series, you might have noticed the tall #10 with the I-fro who had more skills than the rest of the people on the pitch. CSUMB Coach Marc Ferguson supported (support in the off-the-field rugby sense of dollars) Matai in his dream to play at a higher level than even the might Otters or ‘Hawks. Sevens Coach Mike Friday, an Englishman who bought into the Sleeping Giant rubric, thought one way to awaken this beast was to have an open call for players. I can only speculate as to the reaction to the applicant from CSUMB. What? Where? They should have realized that NorCal is known for producing champions at every level, in every division, and that many teams in Pelicanland can boast of a USA championship in one or another division and of having produced multiple Eagle players, with Monterey proud among their ranks. And, as a matter of fact, your faithful scribe, who is 61 years old and has definitely refereed his last competitive match, refereed this World Series Champion in this very season. 8:37 for the culmination of all of many thousands of peoples’ hard work over two-score anni, the players of course first and foremost. Once again the flock will be coordinating our banquet around the USA National team schedule as the United States Eagles take on Samoa and Canada takes on Japan in San Jose. The Pelican Elders will be holding our Annual Awards Banquet in San Jose on Friday, July 17 at the Sonoma Chicken Coop on Skyport Drive – right by Avaya Stadium where the internationals will be held. Please RSVP via email to Jim Crenshaw at crenshaw@cal.net with how many guests you are bringing. Several people have inquired about bulk purchasing tickets for the Pacific Nations Cup on July 18 in San Jose. If you would like to take advantage of this opportunity, sit with your fellow referees and watch the matches please provide us with your desire to do so by clicking on the following link: Register for ticket purchase. You have until May 23rd to order your tickets. After May 23rd you’ll have to purchase the tickets on your own. Wow, Patricia, that is a difficult one and no mistake. No wonder you run the most fun, yet difficult Trivia Night in Pelicanland. Well it is tough to say but tthere really are only 2 contenders, the first being “Who was the last switch hitter to win MVP in the American League?” and the second being “What country currently holds the Olympic Gold Medal for rugby?”. You have to keep an eye on these questions, though, because the American League gives out an MVP award every year and rugby will be reintroduced to the Olympics in 2016 for the Rio games. EDITOR’S NOTE: If you want to know the answers send me an email. We have two opportunities for referee visits to Canada. The first opportunity is June 5th and 6th for the high school championships held in Edmonton. The coordinator for this is our good friend Paul Cassidy. Let me know your availability ASAP(by May 18) by emailing me. The second opportunity is Late June/Early July in conjunction with the Calgary Stampede. Let Bjorn Stumer know your availability for that week’s exchange. As always, the society will pay for your transportation there and back. Hosting will be provided by our gracious hosts. EDITOR’S NOTE: Apparently there were no local games, but our East Coast Pelican is still hard at work. Matches like this are what makes rugby a special sport. Two senior level select side clubs from different continents getting together for the love of the game. The Boston Barbarians are made up of the best players in New England available on the day. This team comprised players from Boston Irish Wolfhounds, Boston RC, Brown U., Providence RC and South Shore RC. The Empire GU playoffs were also scheduled for the weekend, so a great many other D1 and D2 players were unavailable. The British Police Rugby Club comprises, obviously, the best ruggers on police forces from Wales, England, Scotland and Northern Ireland. Boston wore all white while the British Police styled their kit after the B&I Lions: red shirts, white shorts and blue/green striped socks. They did not come here just to sightsee. They are a well drilled club with very good rugby players. They consistently play 5 times a year and tour out of country every other year. This was their second tour to the USA. They will be playing the Empire GU Select Side on Randall’s Island in NYC on May 23. The match was held at the Irish Cultural Center, home of the Boston Irish Wolfhounds. I’ve previously written about the facilities, it is top stuff. Boston came out first with a great try spun wide to the wing. Great platform from the ruck and excellent speed on the wing. Unfortunately their brightest play started and ended 5 minutes into the match. The rest was a resistance against a far superior side. To their credit, the Babas had 3 tries held up in-goal. I couldn’t, after long deliberation and searching for the ball against any blade of grass, justify awarding any of them. The Police got legs and bodies under each one. Despite the score, the match flowed well. Both teams listened to my pre-match instructions that I was here to call the clear and obvious and let them get on with playing the game. The Babas hosted a formal dinner after, where I received the standard tie from the tourists. Is there any doubt that this should be the Photo of the Week? This entry was posted in News on May 20, 2015 by James Hinkin.